CHARLOTTESVILLE, Virginia -- Two troopers are dead after a helicopter crashed Saturday seven miles southwest of Charlottesville, VA, where violent clashes erupted at the site of a white nationalist rally. 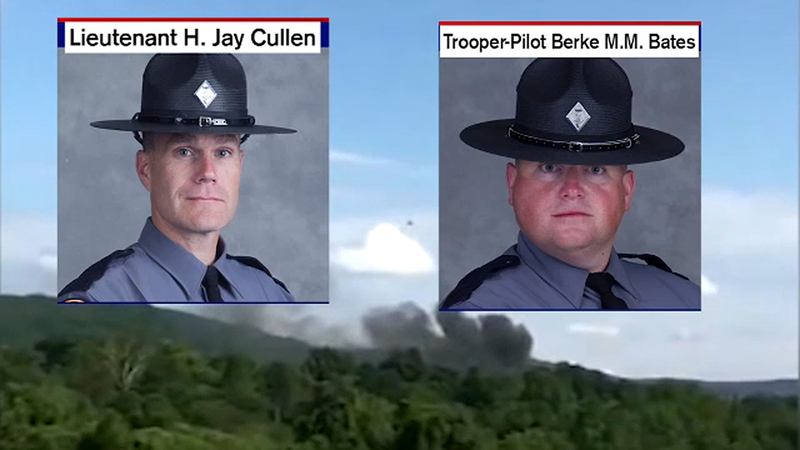 Virginia State Police said Saturday that pilot Lt. H. Jay Cullen, 48, and trooper-pilot Berke M.M. Bates died at the scene. "Our state police and law enforcement family at-large are mourning this tragic outcome to an already challenging day," said Colonel W. Steven Flaherty, Virginia State Police Superintendent in a news release. "Lieutenant Cullen was a highly-respected professional aviator and Trooper-Pilot Bates was a welcome addition to the Aviation Unit, after a distinguished assignment as a special agent with our Bureau of Criminal Investigation. Their deaths are a tremendous loss to our agency and the Commonwealth." Cullen graduated from the Virginia State Police Academy in May 1994 as a member of the 90th Basic Session, he is survived by his wife and two sons. Bates, who would have turned 41-years-old on Sunday, graduated from the Virginia State Police Academy in August 2004 as a member of the 107th Basic Session and just transferred to the Aviation Unit in July. Officials said the incident may have been linked to the rally held earlier in the day; however, it was not immediately clear how the crash was connected. Virginia State Police said Saturday that the helicopter crashed in a wooded area near a home around 5 p.m.
"I turned my head to the sky. You could tell he was struggling to try to get control of it," he said. The National Transportation Safety Board and Virginia State Police are investigating the crash.